Make your own gorgeous tiaras in Twinkly Tiaras! Wouldn’t it be wonderful if there were one universal accessory? Something you could wear anywhere – fortunately, as every child knows, there is: the tiara, the perfect goes-with-everything accessory. 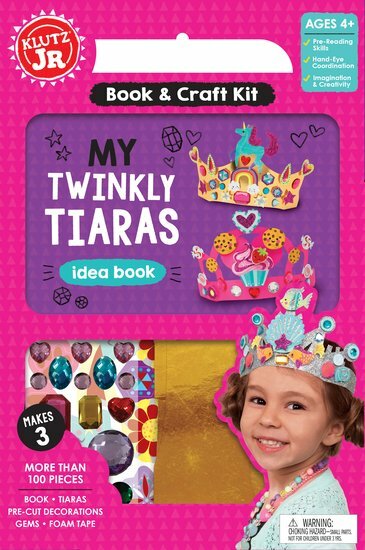 This book comes with three ready-to-design tiaras – and a stencil for making countless more – along with a treasure trove of sparkly doodaas for decorating them. Add a bonus of mini-tiaras (in case any dolls or teddies around the kingdom start feeling a bit left out), and it will give any little child that happily-ever-after feeling.